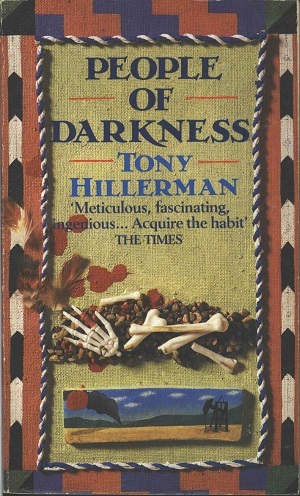 The Sphere Books Ltd paperback edition of Tony Hillerman's People of Darkness (1980), the fourth novel in his Navajo Detective Series. People of Darkness introduces Sergeant Jim Chee of the Navajo Tribal Police, a younger and in some ways more traditional Navajo than Joe Leaphorn.Sphere Books Ltd is a continuation of the Gollanz Ltd publishing house, who first published a British edition of People of Darkness in 1982. Sphere Books published several of Hillerman's novels, and each of their covers follows a similar format: a multimedia collage, over a rough canvas base, that incorporates folk art elements and and kitschy signifiers of the novels' plot elements. In this case, a small ink and water color rendering of an oil pad and a small cluster of skeletal remains are framed by multicolored course string embroidery, with a secondary framing device of abstract and repeated geometric patterns. A smattering of blood and feathers, neither of which manifest in the novel, provide the finishing touches.